The Chicago Blackhawks and New York Islanders face off Friday at the United Center for the second time this season. The Blackhawks came away with a win in the first matchup of the year, topping New York 5-4 on the road. The Islanders have been hot as of late, winning five of their last seven games. After losing a blowout game to the Columbus Blue Jackets 7-0, the Islanders bounced back well against the Dallas Stars on March 2, beating the Dallas Stars 5-4. For the Islanders, every point counts as they try to earn a wildcard spot to earn a spot in the 2017 NHL playoffs. They will face off against a legitimate Stanley Cup contender in the Blackhawks on Friday, taking them on in their home arena, and the Islanders will need to do what they can to at least earn one point while trying to capture a second in the process. For the Blackhawks, the situation is a little bit different. The Blackhawks hold the second spot in the Central Division, just three points behind the Minnesota Wild. The Nashville Predators and St. Louis Blues are chasing them in the standings, but remain 12 and 18 points behind them with 73 and 67 points respectively. The Blackhawks are all but certainly going to qualify for the playoffs this season, but while that’s enough for some teams to consider the season a relative win, the goal for Chicago is always winning the Stanley Cup at this point. If the Blackhawks don’t win the Stanley Cup, then the 2016-17 season will be considered a lost one. With three Stanley Cup wins in the last seven years, the window is still very much open for the Blackhawks to capture a few more. The team has done a good job capitalizing on games as of late, winning 10 of their last 11. The Blackhawks will have to wait until the March 9 matchup against the Anaheim Ducks to see Oduya back in a Blackhawks sweater. The veteran defenseman was acquired ahead of the trade deadline on March 1 but is being held out until that date to ensure that he’s healthy and well-conditioned to help the team make a deep run. 1)Kane scored a hat trick against the Pittsburgh Penguins on Wednesday and will look to remain hot against an Islanders team that has won five of its last seven games. Kane also scored a hat trick on Feb. 23 against the Arizona Coyotes. 2)With the exception of the 7-0 shelling at the hands of the Columbus Blue Jackets on Feb. 25. the Islanders have been one of the NHL’s hottest teams as of late, winning five of their last seven games. The Islanders will look to remain hot against the Blackhawks as they try to improve their stock in the East. 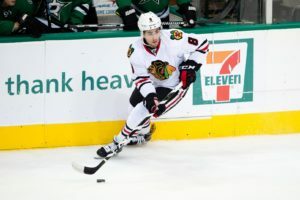 3)Though the Blackhawk weren’t as busy as they usually are at the trade deadline, Chicago still managed to shore up their lineup with the additions of Tomas Jurco and the re-acquisition of Johnny Oduya to add some much-needed defensive depth heading into the postseason. 4)Nick Schmaltz has found his stride in the NHL, scoring three goals and 12 points in his last nine games, being held pointless just once in that period. Though he has only scored six goals and 19 points in 44 games, he’s picked up his game as of late while skating with Toews and Richard Panik and is closing out his rookie season in a strong way. 5)Toews will be playing in his 700th NHL game Friday as he looks to continue his personal hot streak following the trade deadline. The Blackhawks remain one of the NHL’s best teams. The Islanders, despite starting the season off slowly, however, have asserted themselves and are climbing up the standings. With the rest of the Eastern Conference hopefuls surging as of late, the Islanders will need to continue their hot streak if they intend on making the playoffs. It’s still an uphill battle, but New York does currently hold the second wild-card spot in the Eastern Conference, tied with the Toronto Maple Leafs in points with 70, though holding one game-in-hand.